Once a project grows in scope, it becomes inconvenient to manage all of its logic in the Eko Studio’s Code Panel. Checking out a project from Eko Studio allows you to clone the source code of the project to a local git repo, and continue updating its code via git push. 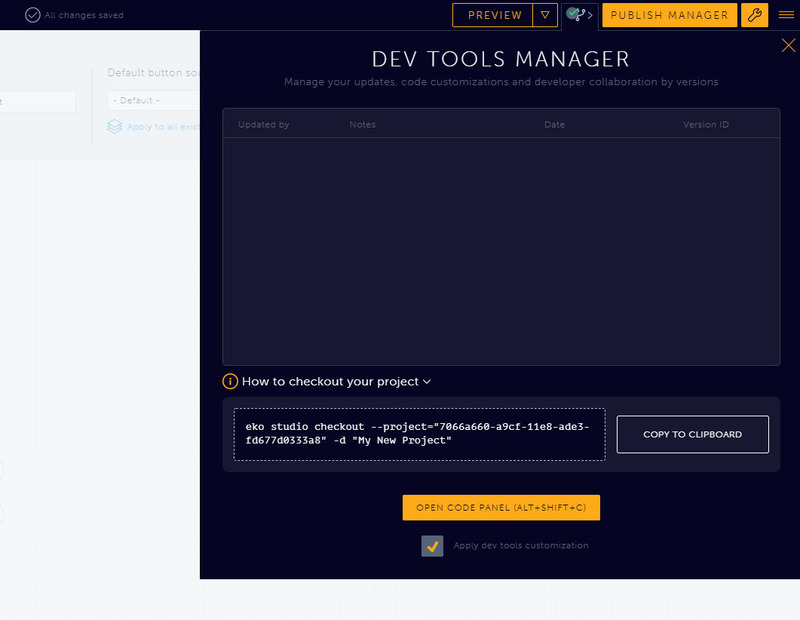 This way, you, the developer, can continue working on the project with your own IDE and tools while other members of the project are free to upload video assets, edit and publish the same project in Eko Studio. If you see an EACCES error when you try to install eko-cli globally check out npm’s documentation. eko is a shorter and easier-to-use alias for eko-cli. 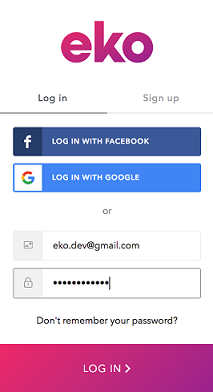 While the documentation uses eko, you can use both. Then you will receive a token which you need to copy and then paste back into the terminal. The checkout process creates a folder with your project name (or __PROJECT_ID__ if no directory was specified) in the current directory. It is a git repository, connected to the project’s remote repository that is edited by Eko Studio. Read the Project Structure tutorial to learn more about what’s inside. Because the project folder is a standard git repo, it’s possible to manage your commits and changes using git clients such as SourceTree. This can help visualize the interactions between commits made locally in your development environment and commits made by the Eko Studio virtual user. The work done on the project is delivered to Eko Studio on git push. If a user makes edits to the project in Eko Studio, git pull will allow you to get them as soon as they are pushed from Studio. Notice that when using git pull, your src/_eko_ directory (and occasionally your src/js/app.js, if changes were made in the code panel) will be overwritten. 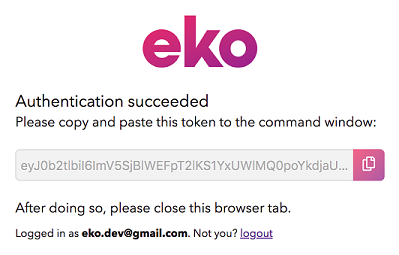 You can think of Eko Studio as a not-really-thoughtful developer, who commits with --force without concern for merge conflicts or overwriting code. See the Building and Running tutorial to learn more. To make life a little easier, we offer an extension for Visual Studio Code. While editing a project, it will auto-complete API definitions, nodes and UI elements IDs, saving you from repeatedly copying and pasting them. See VSCode’s Customizing IntelliSense Guide for more information.